The record cash seizures within days ahead of polls have kicked up a political storm in the state. Tamil Nadu leads the pack when it comes to the single largest seizure of cash. On Monday, Rs 11.53 crore unaccounted cash was seized from a cement warehouse allegedly belonging to an associate of a DMK leader in Tamil Nadu's Vellore district. Under the scanner is DMK's candidate Kathir Anand. Officials suspect the cash was used for to ensure his victory in polls. Election officials seized Rs 1.99 crore from DMK ally Viduthalai Chiruthaigal Katchi (VCK) also in Perambalur district on Tuesday night. 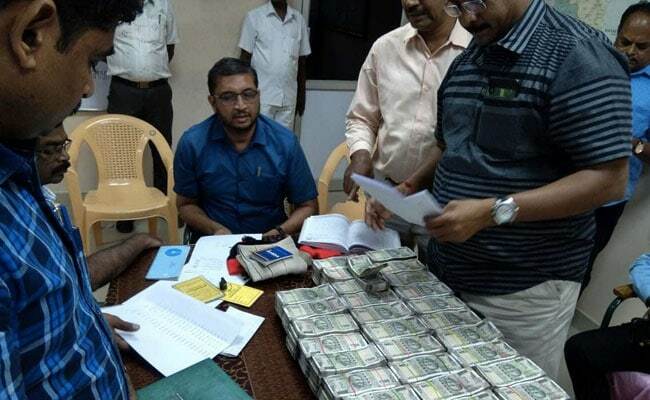 No political connections have been attributed to the cash seizure of Rs 15 crore from Contractor N Sabesan who owns M/S Dowell Associates in Chennai and Rs 3.4 crore recovered from abandoned bus in Salem. The record cash seizures within days ahead of polls have kicked up a political storm in the state. The DMK says these are politically motivated allegations. A Saravanan, DMK Spokesperson told NDTV, "The Income Tax department is colluding with the BJP and AIADMK in Tamil Nadu. It is being projected as though the opposition parties are trying to distribute cash when the truth is other way around. Today we've registered a complaint before the Election Commission that cash is transported through police vehicles." DMK chief MK Stalin said these raids are an attempt to scuttle by-elections in two seats falling under Vellore district to save the AIADMK government. Along with Lok Sabha polls, the state will also have by-elections to 18 of the 22 vacant seats. He said, "Presently DMK alliance has 97 seats. If we win all 18 seats our strength would become 115. Presently AIADMK has only 113 and they want to avert this situation by cancelling polls in two seats". Income tax officials say in the earlier elections most of the seized cash was returned following disclosure of sources. Ahead of the RK Nagar bypolls in Chennai in 2017, Income Tax authorities had recovered documents from the state health minister's house suggesting payment of around Rs. 100 crore to voters in the constituency. However the case was ultimately closed. The Election Commission denied allegations of any bias and puts the onus on investigators. Election Commissioner Ashok Lavasa who reviewed election preparedness in Tamil Nadu, said, "We will reveal names of the violators based on outcome from initial investigation. However, the responsibility of prosecution lies with investigative agencies". Despite tough measures and high-value seizures, many say this is just the tip of the iceberg and that Election Commission remains a toothless tiger and a mute spectator.